Elite 360 with Precision Application Technology electrostatically applies an antimicrobial intervention to cover a product, using the least amount of antimicrobial possible, while still being as effective as possible. 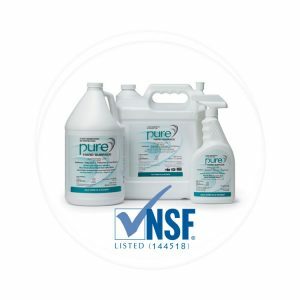 The Precision Application Technology not only reduces pathogens, but according to the company it can reduce chemical and water usage by as much as 95% and has shown up to a 2.0+ log reduction and 360° product coverage, as well as reducing wastewater treatment costs. 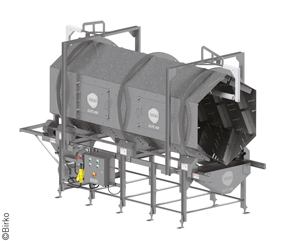 Elite 360 is currently on the market for red meat processors and will be available for use in the produce and poultry industries in the second half of 2019. Birko, 800-525-0476, www.birkocorp.com. 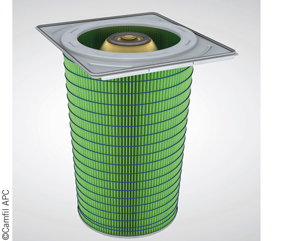 Gold Cone X-Flo (GCX) filter cartridge for high-efficiency industrial dust collection uses a proprietary inner pleat pack with an open-bottomed inner cone of media that expands the usable surface area of the cartridge. Because the HemiPleat design exposes more media to the airstream, more dust is loaded on the filter and released during pulse cleaning. The cone is configured so that pulsed air is evenly distributed top to bottom along the outer pack of the filter and down through the inner cone pack. That means with each pulse, the GCX cone cartridge ejects more dust out of the collector, straight down to the hopper. These filters are available in a selection of regular or nanofiber media and meet EPA particle emission requirements. GCX filters were designed specifically for Camfil APC’s Gold Series X-Flo dust collector. Camfil APC, 800-479-6801, filterman@camfil.com, www.camfilapc.com. BioSpray-10 is a portable option for surface sanitation that is designed to limit the growth of bacteria and other pathogens that can be missed with other methods of sanitation. 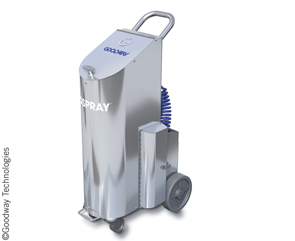 It has many of the same features as its predecessor, BioSpray-20, but in a smaller, lightweight system. 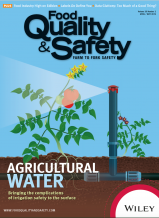 BioSpray-10 is safe for use around water-sensitive equipment and machinery. The system is non-electric, with no power source required. Goodway Technologies, 800-333-7467, www.goodway.com. Made from Detectamet’s detectable polymer, the company’s new temperature probes are both metal detectable and X-ray visible. 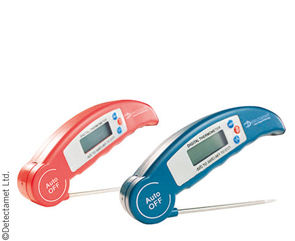 This digital food temperature probe features a smooth, durable surface and its wide measuring range makes it suitable for all food, storage, and equipment checks. It can also be stored in a wall-mountable, detectable holder for easy access at each crucial stage in the food production and storage process. Detectamet Ltd., sales@detectamet.com, www.detectamet.co.uk. The Version 8 of SupplyChainMetrix (SMX) includes several advancements in technology and features for the supply chain quality management solution. Updates to SMX include enhanced partner onboarding and maintenance, automated payment processing, and a new option for document-based specification management. Customers can now choose between managing specifications using data-driven forms or as document attachments, expanded ingredients and sourcing functionality, and enhanced configuration management. In addition, there are new features and reports for automating the resolution of product- and guest-related incidents between restaurants/retail locations, distributors, and suppliers. ComplianceMetrix, LLC, 858-866-8888, sales@compliancemetrix.com, compliancemetrix.com. APRIL Eye is an artificial intelligence-based vision system for date code verification. The system removes the operator from the date code verification process, achieving full automation to reduce the risk of product recalls and emergency product withdrawals caused by human error on packaging lines. By taking photos of each date code, the system can read them back using scanners to ensure they match the programmed date code for that product run, allowing manufacturers to achieve unmanned full traceability. Running at speeds of over 300 packs a minute, it also allows them to increase throughput. The production line comes to a complete stop if a date code doesn’t match, ensuring that no incorrect labels can be released into the supply chain. OAL, sales@oalgroup.com, www.oalgroup.com.